Dedicated to helping all types of athletes to achieve their goals, New Balance has made this their ultimate mission in life. For more than a century now, these pioneers have primarily focused and improved on research and development to give you the best shoes on the planet. Today, the company diligently focuses on meeting the specific needs of everyday athletes, providing an incredible array of choices for everyday wear and even catering to the special needs of people with issues like heel pain and Plantar Fasciitis. For runners, flat feet can really cause physical pain and even end entire careers if not remedied. To help you keep pushing your limits for morning hikes, jogs, and marathon runs, New Balance has developed some of the best support shoes you will ever find on the market. Here’s a review of the top 5 most popular running shoes for Plantar Fasciitis which also provide good support for men and women with flat feet. When hunting for a Plantar Fasciitis running shoe, it doesn’t hurt to find something with a couple of accolades to its name. The Fresh Foam 1080V6 had been awarded the ‘Best Update’ Award from Competitor magazine. As stated in the magazine, New Balance Fresh Foam neutral shoes have continued to evolve quite nicely thanks to data derived from a myriad of runners. When you wear the New Balance Fresh Foam 1080 Running Shoe the most notable thing is the thick and soft cushioning plus the extra wide footprint. Also, with the addition of flex grooves, in both the midsole and outsole, you get way more increased flexibility and the smoothest of heel toe transitions. Boasting of 100 percent American craftsmanship, the 990 continues going stronger and better with a 30 year legacy of superior performance and iconic style. This ideal combination of cushioning and stability makes life much easier for people with flat feet and thanks to incredibly light pigskin leather; you never have to deal with heavy shoes again. For men and women with plantar fasciitis, these running shoes offer immense cushioning and feel like natural shock absorbers when your foot hits the pavement. New Balance understands that people with flat feet need a little something extra, that’s why the pros ensure that the 990V4 has appropriate support and fits like a charm. Unlike other shoes that rub you funny, this particular model is built precisely for your size and has durable treads at the bottom to ensure you never slip. If you suffer from heel pain or what is commonly known as plantar fasciitis, whether you’re a man or woman, you undoubtedly know painful and frustrating it can be. Even a simple walk to the park, around the block or walking your dog quickly becomes excruciating and uncomfortable. If the only thing you can think of while having fun outdoors is how you can’t wait to get off your feet and watch some TV, then you really need a shoe worth wearing. The New Balance 877 combines a suede and mesh upper with the latest footwear technology to give you the only shoe from NB that allows you to walk with both soul and sole. Avid walkers who do it either for fun, fitness or as a career will especially enjoy the extreme lightness of the shoe since it is one of the most weightless models from the brand. Walking might be one of the simplest and core activities we learn to do since childhood. For some, it is as easy as ABC, but for others, walking does not come naturally. We all know the feeling. Whether it is a family trip, school hike or just going about your daily activities, walking can get tiring for even the fittest people. Now, imagine trying to keep up the pace with an evolutionary disadvantage. I’m talking about flat feet or plantar fasciitis that affects a very large percentage of the population. This condition makes it extremely difficult for people to walk, let alone run for hours. Instead of being a sore walker who just wants to sit down and rest every other minute, it’s time to show everyone that flat feet should not hold you back. With a pair of New Balance 411V2 Walking Shoes, you can now walk for hours on end without a single complaint from your feet. People with plantar fasciitis require a little extra room; tight shoes are not really as healthy. This particular shoe includes a larger toe area that will accommodate wider feet. This way not only are your toes free from the crushing grip of a bad shoe, but your leg also gets conditioned to overcome the annoying plantar fasciitis. Are you an athlete looking for the ultimate performance and flexibility in a shoe? Do you suffer from heel pain of painfully flat feet? If even just one of these answers is yes; then you definitely have to check out the New Balance 870V4 Running Shoe for Men and Women. Not only do these shoes offer incredible arch support, but they also promise athletes a comfortable run mile after mile without any pinching or incessant rubbing. The 870V4 is a highly unique shoe that looks and performs way better than what you see there on the price tag. If you are interested in the lightweight trainer category, this Running Shoe is as light as a shoe can get. This makes it suitable for anything from casual wear to a serious, 10 k marathon across the country. Plantar fasciitis patients will especially enjoy the in-built arch support that is perfect for reigning in the slight, inward rolling of the foot. For the upper part, you get lots of flexibility due to the seamless, one overlay construction. While running and walking shoes have been around for the longest time, it’s only until recently that people have actually started paying attention to the hazards of flat feet to performance. There is really no other way to look at it. Heel pain is a real threat to an athlete’s career and could lead to an endless list of complications, each more painful than the last one. Not only does plantar fasciitis rob you or your ability to walk, jog or run effectively, but it also causes tremendous amounts of pain and discomfort with every excruciating step. 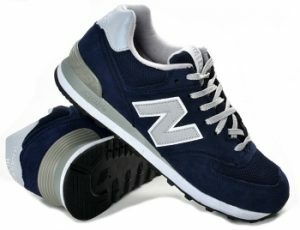 Fortunately, New Balance is way ahead of the curve and thanks to years of research and development, people with all sorts of needs are steadily turning to them for help. New Balance continues to be a global leader in athletic footwear for the modern enthusiast and will continue to do so; driven by an unquenched and relentless desire to improve and better themselves further. From amateur level to professional, runners from all walks of life rely on New Balance for all their custom needs. Do not let something as minor and reversible as Plantar Fasciitis limit your capabilities. Make sure you grab a pair of any of the above New Balance shoes for Plantar Fasciitis and achieve your full potential today.